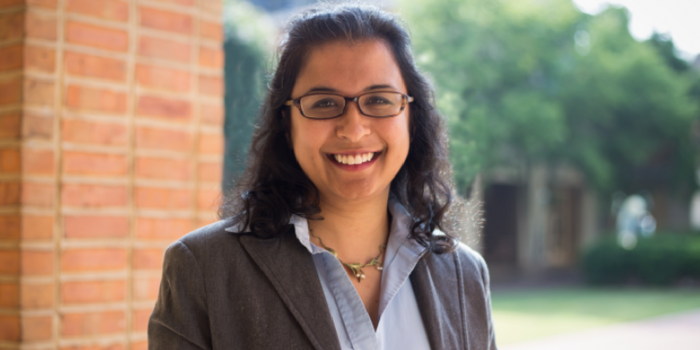 Raina Haque, a Winston-Salem lawyer and founding partner of Erdős Intellectual Property Law + Startup Legal, will join Wake Forest University School of Law as a Professor of Practice in technology on July 1, 2018. Haque most recently co-taught the course, “Law 469: Technology and Modern Law Practice,” as an adjunct professor for the law school along with Jon Mayhugh (JD ’16), who works with Haque at Erdős. In addition to continuing to teach the course on technology in the modern law practice, Haque will add a course in blockchain, and smart contracts. Haque will teach a third course to law students, which may be open to non-Wake Forest students interested in executive education on technology. Haque will also continue her law practice. “From my brief time with Raina, I can tell you that she will do all that with energy to spare,” says Dean Suzanne Reynolds (JD ’77). Haque specializes on computational law and emergent technologies. “In Spring 2019, I will teach courses at Wake Forest Law where students and executives learn about ​blockchain technologies and cryptoventures, how to program smart contracts,​ and alpha and beta test cutting-edge smart contract technologies. These technologies touch almost all areas doctrinal areas of law, and we will explore those intersections,” Haque explains. As a research fellow, Haque ​developed deep artificial neural network applications​ that were state of the art​. She is among the first patent attorneys to work in the blockchain technology space and has written several articles on guidance on intellectual property and regulatory matters. She has been called to train attorneys in the blockchain space at other law schools and professional lecture series in New York City and Silicon Valley. ​Her fintech clients and advisees include government agencies, consumers, small businesses, startups, larger law firms, and multinational banks. She is a leading contributor to the North Carolina Bar Association (NCBA)’s Future of the Law annual report on blockchain technologies and most recently spoke on a blockchain ​panel at the annual NCBA meeting. Her firm is called upon to advise government agencies about blockchain technologies and cryptoventures. “One of my former students landed an in-house counsel position at a top four multinational professional services firm because he demonstrated, in interviews, that he could separate the potential from the hype in blockchain technologies and cryptocurrencies. Our students develop a nuanced view of this techno-legal space–its promises, perils, conundrums, and areas for further innovation,” Haque says. Haque is also developing courses that will address advances in artificial intelligence technologies, neurotechnology, robotics, and data security.